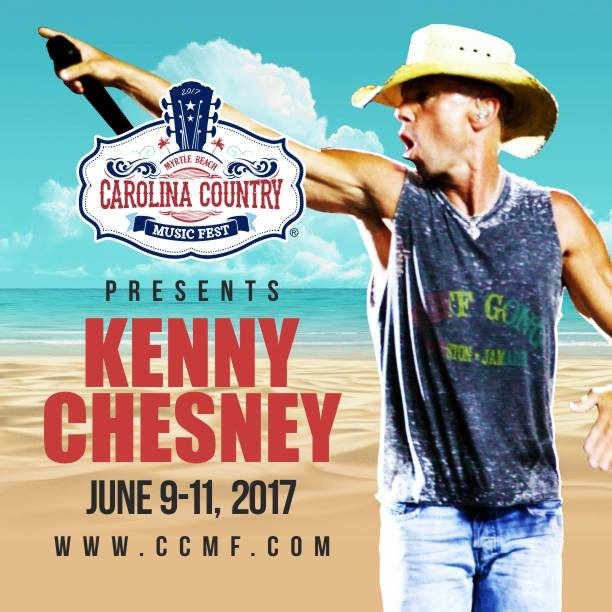 The Southeast’s premier country music fest kicks off summer season in Myrtle Beach, S.C.
"CHARLOTTE, NC (September 22, 2016) – Carolina Country (CCMF), in conjunction with Full House Productions (FHP) and Visit Myrtle Beach, reveal that Kenny Chesney – eight-time Entertainer of the Year – will headline the 2017 oceanfront music festival June 8-11. The only country artist on Billboard’s Top 10 Touring Acts of the Last 25 Years, in spite of only having 12 eligible tours, Chesney’s love of life, music and friends have driven his music and defined what an army of fans know as the No Shoes Nation. Chesney’s 28 No. 1 singles including “American Kids,” “Save It For A Rainy Day,” “When the Sun Goes Down,” “No Shoes, No Shirt, No Problems,” “Anything But Mine,” “You & Tequila” with Grace Potter and the brand new “Setting the World on Fire” with P!NK, embody the free-spirited moments that make CCMF a can’t-miss country music event. 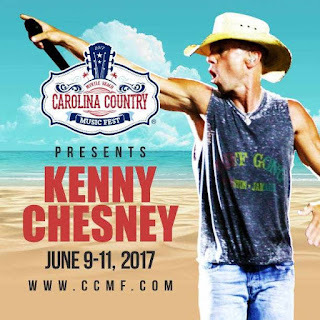 Tickets for CCMF are available now and can be purchased at www.CCMF.com. For accommodations or more information about Myrtle Beach, go to www.VisitMyrtleBeach.com. Kenny Chesney, described by The Dallas Morning News as “two parts Jagger, one part Springsteen and one part Billy Graham,” has been creating high-energy highpoints of summer for people for a dozen years. Having sold more than 30 million albums, he lives to perform – having headlined 135 major stadium shows over 10 tours, as well as recording duets with Uncle Kracker, Willie Nelson, Mac McAnally, Dave Matthews and the Wailers. “Cosmic Hallelujah,” the follow-up to the four -No. 1-hit-yielding “The Big Revival,” hits streets Oct. 28."